1Add all ingredients except for shredded coconut to a medium bowl; mix well. The batter should be stiff but not too dry. If it's too dry or crumbly add a 1-2 tbsp of water but be careful not to make it to runny as you need to form it into balls. 2Sprinkle the shredded coconut onto a plate. 3Using a tablespoon scoop the batter out and roll into balls. 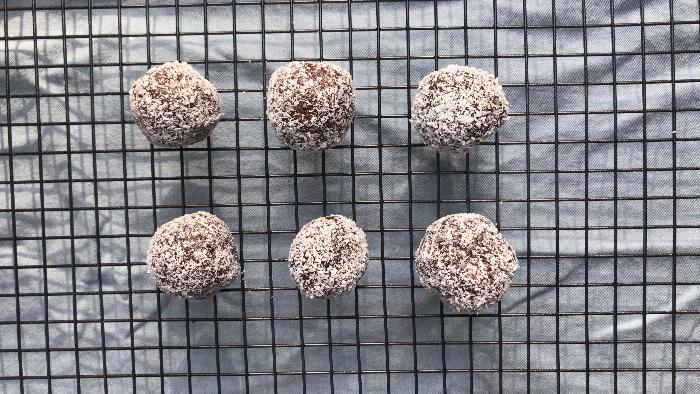 Roll balls in shredded coconut until well coated. 4Refrigerate for 30 minutes and enjoy. 5Yield depends on how large you roll the balls.